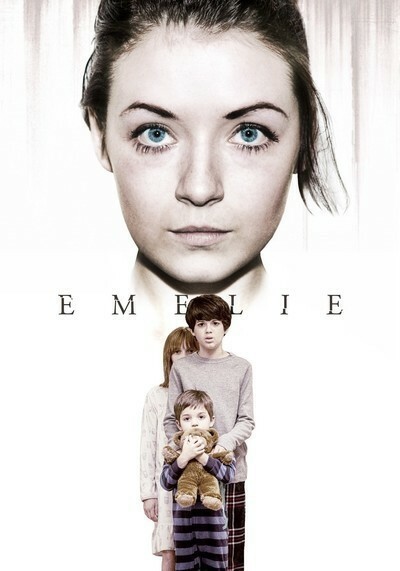 Anchored by a spectacularly committed performance by Sarah Bolger (best known for TV’s “The Tudors” and “Once Upon A Time”), “Emelie” is a tidy and nasty and often effective thriller that doesn’t quite blossom into full horror. That might come as something of a relief, as this is a bad-babysitter movie, one in which three children of fair to more-than-middling adorableness are threatened and terrorized in increasingly creepy and harrowing ways. The movie begins with a terrific hook: the sound of a seemingly self-absorbed Millennial talking into a cell phone, complaining she can’t go to some social function because she got rooked into a babysitting job. We see the young woman, walking down a suburban street in grey weather. A town car stops, the driver asks the young woman for directions, the young woman gets off the phone, starts to try to help, and wham, she’s assaulted from behind and bundled into the car, which drives off. The camera, which was viewing this from a distance, pans left, and the view of the action is obscured by thick out-of-focus tree branches. The direction here, by Michael Thelin, a TV and music video veteran here making his first feature, is assured, almost inventive. And now the audience knows, right off the bat, that the babysitter later picked up by suburban dad Dan (Chris Beetem) is not who she seems. Dan is taking his wife out for their thirteenth anniversary (hmmm) and leaving Bolger’s “Anna” to look after sullen 11-year-old Jacob and super-moppety Christopher and Sally. At first the new babysitter seems cool—she liberates Jacob’s game handheld from confiscating mom and tosses it to him with—could it be?—seductive insouciance. Soon she’s supervising “let’s pretend” games with the younger kids, letting them tear apart the good living room cushions to make costumes, and telling them “Pretending is a super power. And when you get really good at it, nobody can tell you’re pretending anymore.” Things take an even more “aiiieee” turn during a game of hide-and-seek, in which Jacob finds “Anna” … sitting on the toilet. Jacob’s initially presented as a problem child but it becomes pretty clear that the scenario is going to call for him to step up to some kind of plate. He looks into the new sitter’s bag and finds out, among other things, that her name is not Anna but rather, yup, Emilie. At this point in the film, which has been pretty relentlessly tense and unnerving, some conceptual cracks start to show. Emelie’s a malevolent presence, to be sure, but she’s also someone who wants something, and there’s this thing in movies like this wherein the ratio of aberrant behavior that’s not useful to the character’s goal and aberrant behavior that IS useful to the character’s goal goes somewhat askew for the sake of scares. There’s a point where the audience member stops thinking, “Yikes, this character is trouble,” and starts thinking, “Okay, what’s the deal with this weirdo?” So, yes, alas, the movie crosses that line. Worse, once the filmmakers get around to illuminating Emelie’s rationale, the backstory and its attendant components are pretty weak and unconvincing tea. I know it’s not easy constructing a good satisfying basis for your evil babysitter but they should have put in a little more effort, frankly; it’s part of what would have made the difference between an passable, occasionally interesting thriller and a really outstanding one. Jacob does step up to the plate, and the result is reasonably satisfying, but the direction shifts from tensile to muddy in the run-up to the finale. “Emelie” has enough good stuff in it that I wished I liked it better, and committed genre hounds may think I’m nitpicking here. I choose to not, however, complain about the movie’s weird mix of props: when Emelie shows the kids a very inappropriate video, it’s from a VHS tape, and on a CRT TV; while there’s plenty of cell-phone communication here, it’s mostly on flip models, and a touch-tone desk phone features prominently. I fretted a bit about all this anachronistic hardware, but then I saw in the credits that the movie was shot in Buffalo, New York, and it all made sense; those people hang on to old tech out of spite.